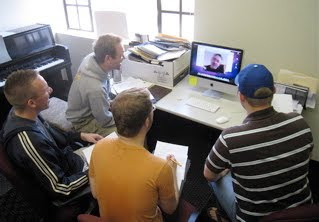 This morning- early evening in Ireland- Jace, Gabe and the two Matts gathered around the computer for a Skype session with composer Michael McGlynn. At our National Youth Choral Festival next week we will sing - with the assembled 400 students- his Si Do Mhaimeo I in Irish Gaelic and wanted to work on our pronunciation. Tomorrow we'll be working on Chinese for the world premiere of Chou Nu er by Yi-Wen Chang which will also happen at the National Youth Choral Festival final concert March 29 in Davies Hall.